On May 19, 1959, two U. S. Air Force F-89 Scorpion jets attached to the 58th Fighter Interceptor Squadron were dispatched from Otis Air Force Base in Falmouth, Massachusetts, to intercept an unidentified aircraft that appeared on air defense radar. The flight was actually an unannounced drill. Such drills were common, one air command would send a plane into another air command’s air space to test readiness and proficiency. The crew of one F-89 consisted of the pilot, Captain Arthur Canella, 29, and his radar observer, Lieutenant Robert J. Scearce Jr., 26. 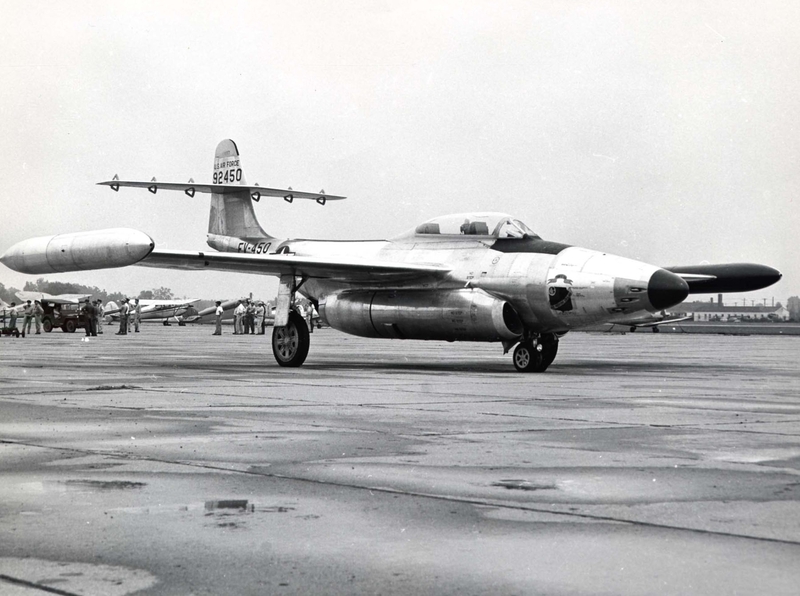 Once airborne, Canella’s F-89 was designated the radio call sign, “Kilo November Nine”, and the other “Kilo November Ten”. Even though they were scrambled out of Massachusetts, they were put in radio contact with the New York Air Defense Sector which was using the call sign “Occasion”. Ironically, Lieutenant Scearce wasn’t scheduled to be on this particular flight. He was supposed to be relieved at the end of his shift by another radar observer, but when the man showed up he asked Scearce to cover for him for an hour or so until he could register his car. Scearce agreed, and thirty minutes later the scramble horn sounded. After some course correction instructions between Occasion and Ten, Occasion checks on Nine. This was the last radio transmission received from Kilo November Nine. Canella and Scearce had broken to starboard, and unknowingly began heading almost straight down due to the lack of visual reference points. The aircraft began picking up speed, and then broke the sound barrier, something it was not designed to do. When it finally broke free of the clouds the situation became apparent, and the crew was forced to eject. The Plexiglas canopy flew off as explosive charges under the crews’ seats blew them free of the cockpit. For the two men, hitting the slipstream at 700 mph was like being slammed into a brick wall. Both injured their shoulders in the bail out leaving them incapable of controlling their parachutes as they descended. Meanwhile, those at Air Defense Command began to realize something was wrong. Both Occasion and Kilo November Ten tried to radio Nine, but got no response. Occasion reported to Ten that they had lost Nine on radar. The men bailed out over the city of Woonsocket, Rhode Island. Many on the ground who witnessed the parachutes deploy first thought it was all part of a stunt connected to the upcoming Madi Gras celebration. at 85 Fairmont Street, Woonsocket, R. I. 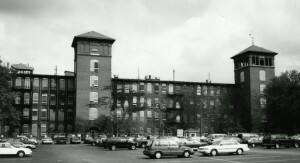 Lieutenant Scearce landed hard on the roof of the U.S. Rubber Company at 85 Fairmont Street, suffering from multiple serious injuries connected to the bailout. Employees of the plant climbed to the roof using a fire escape. Dorothy Kane, the industrial nurse for the company, began administering first aid while police and firemen converged on the area. Scearce was transported to Woonsocket Hospital where he stayed for the next eleven days. Meanwhile, Captain Canella landed in Harris Pond next to the Precious Blood Cemetery in northern Woonsocket. Looking down during his descent he saw 17-year-old Roland Ruge working in the cemetery and began calling for help. The wind carried him across the cemetery and straight into Harris Pond where he became tangled in the cords of his parachute. Acting quickly, Roland dove into the chilly water and swam 200 feet from shore to reach Canella. Roland struggled to pull the injured flyer to shore while keeping his head above water. As he neared shore someone threw him a rope. Both Canella and Ruge were transported to Woonsocket Hospital for treatment. While the captain was admitted for his injuries, Roland was treated for hypothermia and released. 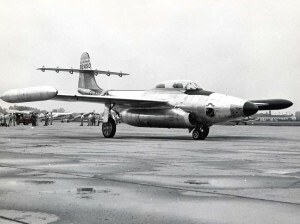 While the crew of the F-89 came down in Woonsocket, the aircraft continued down into the neighboring town of North Smithfield, about 200 yards west of Greenville Road, (Rt. 104), at a point about three-tenths of a mile south of where Providence Street intersects with Smithfield Road. The plane exploded in a massive fireball. The wreckage at the crash site was scattered in a swath a half-mile long and roughly 300 feet wide. Both engines were found intact approximately 300 feet past where the initial impact occurred. The fires burned hot enough to melt the aluminum from the plane. In one area, it was reported that the melted aluminum remained liquid until the firemen cooled it with water from their hoses. The ejection seat belonging Lt. Scearce was later recovered by on Wright’s Farm on Woonsocket Hill Road, in North Smithfield, which is several miles away from where the air-crew parachuted to earth. The Scorpion involved in this crash was an F-89 J, serial number 53-2621A. While the aircrew lay recuperating at Woonsocket Hospital, Roland Ruge was hailed a hero by the Air Force for saving Captain Canella’s life. Roland later received an official award from the Air Force and was given a tour of Otis Air Force Base. While being given the tour, he was able to view the remains of the wrecked F-89, and was presented with the cockpit compass as a keepsake. Woonsocket Call, “Two Bail Out Safely As AF Jet Crashes In North Smithfield”, May 19, 1959. On the afternoon of August 22, 1946, a U.S. Navy OY-1 training aircraft, (120461) took off from Weymouth (Mass.) Naval Air Station with two men aboard. The pilot was identified as John Cote, of Belmont, Mass., and the passenger as Dr. Leonard P. Johnke. 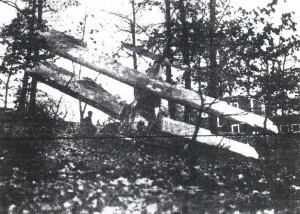 Shortly before three o’clock, while the plane was over North Smithfield, Rhode Island, the engine began skipping and loosing power. Cote began looking for a place to land, and saw Barry Memorial Field on the Woonsocket/North Smithfield town line. As the plane lost altitude it barely missed the power lines of the New England Power Company on Greenville Road. As they came upon the field they discovered that there was a youth baseball game in progress. Sticking their heads out of the airplane they began shouting warnings for the players to get out of the way, but the boys just stood transfixed. Seeing that the boys weren’t getting out of the way, Cote gave the plane full throttle and had just enough power to swoop low over their heads. At the far end of the field he attempted to turn the plane around, and as he did so, nosed into the field. Besides the players and spectators, the crash was witnessed by two Rhode Island state troopers who happened to be a block away at Park Square when the accident happened. They transported Cote and Johnke to Woonsocket Hospital in the back of their patrol car to be treated for non life-threatening injuries. This was not the first time an aircraft had landed in Barry Field. On June 27, 1934, a Greenfield, Mass. couple en-route from Greenfield to Boston got lost in foggy weather due to a malfunctioning compass. While trying to orient themselves, they came upon Woonsocket, and landed at Barry Field to get their bearings. Woonsocket Call, “Aviator Lands At Barry Field Here To Get Bearings”, June 28, 1934. On the afternoon of March 17, 1936, Waldemar M. E. Hagberg, 26, of Springfield, Massachusetts, flew two passengers from Springfield to Boston. He later left Boston Airport at 8:40 p.m. to return to Springfield, and got lost in fog as he neared Worcester. Realizing his situation, he set down on the frozen ice on Indian Lake located in northern Worcester, but afterwards discovered that he couldn’t get to shore due to surrounding water. He therefore took off again hoping to find Grafton Airport in the neighboring community of Grafton. Unfortunately the Grafton Airport wasn’t lighted, and Waldemar circled for some time unable to locate it. He then decided to set a course towards Providence, Rhode Island, but found the weather getting worse the farther south he flew. As he passed over the City of Woonsocket, he saw the lights below and began looking for a place to land. After circling for several minutes he saw what appeared to be a clear area. The area was dark, which indicated that there were probably no wires from streetlights or buildings, but he couldn’t tell about any trees. Fearing that he might not find another opportunity, he decided to take a chance and make a landing. After cutting his motor and turning off his navigation lights to prevent a fire, he nursed his airplane down slowly until the landing gear unexpectedly struck some tree tops. Waldemar yanked back on the stick as the plane tore through the branches and came to rest almost nose first. Waldemar was shaken, but not injured. As he climbed fro the wreck, he discovered that he had crashed in Woonsocket’s Oak Hill Cemetery, which accounted for the trees and lack of lights. Officers W. L. Cote, and William Brady transported him to Woonsocket Hospital for examination. The plane was a Kittyhawk bi-plane with room for a pilot and two passengers. In the spring of 1919, the U.S. Army was looking to recruit new pilots to replace those that had been discharged since the end of World War One. To that end, the army organized “air circuses” to be performed by army pilots at local airfields around the country. The events would be advertised in local papers to generate interest, and usually drew large crowds. 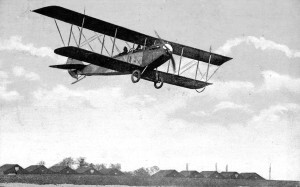 So it was on June 12, 1919 that a U.S. Army, Curtis bi-plane, took off from Mineola, Long Island at 11:15 a.m. headed for Middletown, Connecticut. The pilot was Lieutenant R.C. Mofett and the observer was Private O.V. Rubel. They arrived at Middletown in the early afternoon and ate lunch while their plane was serviced. An hour later they were airborne again and set a course for Camp Devens, Massachusetts, where they would join up with other aircraft. As they were passing over Burrillville, Rhode Island, Lieutenant Mofett realized they were low on fuel. Apparently the ground crew at Middletown had neglected to top off the tanks. Air fields were few and far between in those days and landing in just any open field carried risks. The landing gear could land in a rut causing it to nose-over, or a wing could dip causing it to tear away. Their maps showed that the nearest airfield was in Woonsocket only a few miles away. As the plane neared Woonsocket Airport, the motor began to sputter and Mofett realized they would never make the air field. Looking down, he spotted an open area known as “Ronian’s Field” near present-day Mount St. Charles Academy, and put the plane in a glide and aimed for the field. As the ground loomed closer, Mofett suddenly noticed young Evelyn Moody sitting on a stone wall at the near end of the field. He could feel the plane dropping lower than he expected, and realized there was a good chance they might not make the field. If that was the case then they would strike the wall right where the little girl was sitting! Mofett shouted desperately at the little girl who looked up to see the aircraft coming straight at her. There are many children and adults alike who would have sat frozen in terror at such a sight, but Evelyn was quick to react. Not a moment to soon, she rolled off the wall and landed on its opposite side just as the landing gear crashed into the very spot where she had been sitting! With its landing gear torn away, the aircraft passed over Evelyn as she lay hugging the ground against the far side of the wall. 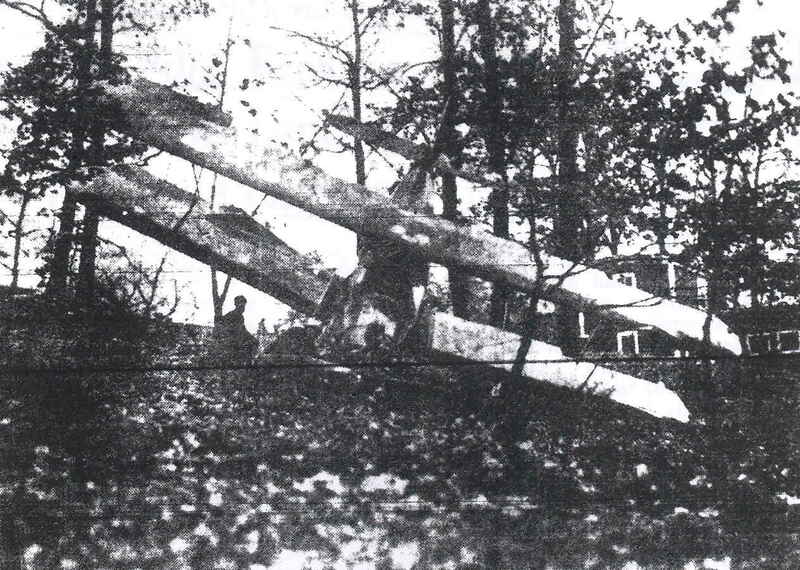 When the fuselage struck the grassy field it plowed into the soft earth throwing its occupants forward against the front of their cockpits. Lieutenant Mofett suffered a gash to his head that would require stitches, but otherwise the men were alright. Evelyn was lucky too, and stood up to stare at the wrecked plane, a sight she would undoubtedly remember for the rest of her life. It was reported that the accident attracted almost 5,000 people from the area. Woonsocket’s Chief of Police was forced to detail a squad of officers to hold crowds at bay until Army officials could send mechanics to remove the plane. In the meantime, the aircrew was taken to the St. James Hotel in downtown Woonsocket.